Last update of page: 17 March 2010. The Barclay/Estrup family enters into Douglas J. Graham's Family Reunion through his maternal grandfather, John Barclay Estrup, a Danish immigrant to Western Canada. In the family tree and in the texts below, bolded names are individuals that are covered on this web page. Hyperlinked names lead to other chapters of this site. The Scottish and English Barclays are of Norman origin and the surname comes from Roger de Berkeley who may have come to England ca. 1066. A couple of sources which provide some general information on the Barclays (history, origins, tartan, etc.) are the sites at Electric Scotland and Tartans.com and a more detailed "The Misty Origins of the Barclays". Our particular line of Barclays can be traced to Barclays of Danzig, Poland in the 1700s. They were presumably of Scottish or English origin but our research on various Internet sites has not helped clarify their origin. Surnames in this line of our family have changed and evolved in a rather confusing way. The lineage traced here starts with three generations of Barclays, originating in Danzig and emigrating to Denmark, but presumably of Scottish or English origin. Bolette Kirstine Barclay then married Niels Nielsen Estrup in 1838. The latter's original name was Niels Nielsen but he adopted the name Estrup out of convenience, taking the name from his home town of Estrup (see futher notes below). As best as we can determine, the following generation, that of Pastor Julius Benedict Estrup, did not have their mother's name Barclay as part of their names. However, in the next generation, the name Barclay of the paternal grandmother resurfaces. On Johannes' birth certificate and on his first Danish passport his name clearly appears as "Johannes Barclay Estrup", the name not hyphenated, and Barclay intended as a middle name and not as a surname. It is not known if any of Johannes' siblings also had Barclay as part of their names on their birth certificates nor if they used the name Barclay but in the death notice of their mother Ingeborg, the children are all listed as Barclay Estrup. As noted in more detail below, once in Canada, to avoid confusion with his cousin Arthur Estrup (both were painters in Calgary), John dropped the name Estrup and used the name "John Barclay" for the rest of his life (the Johannes had been anglicized to John upon his arrival in Canada although he was also known to friends as "Jack Barclay"). To our knowledge, this name change from his original name of "Johannes Barclay Estrup", Estrup being the last name, to "John Barclay" was never legally made. On his marriage certificate, the name appears as Johannes Barclay Estrup (to be confirmed). John Barclay's children were born, according to their birth certificates, as Margaret Barclay Estrup and Paul Barclay Estrup. Margaret always used "Margaret Barclay" as her maiden name, using however Margaret Graham now as her married name. Paul in his later years began using Estrup in his surname in a hyphenated form, as "Paul Barclay-Estrup". There are records of two brothers born in about 1736 and about 1742 in Danzig. Our sources of information are various records and documents contributed by Poul Estrup (8) and Ingeborg Møberg (4). 1) Andreas Johan Barclay, b. ca. 1736, in Danzig, and died April 16 1802, in Copenhagen. We have a copy of his 24 April 1802 death notice issued by the Vital Statistics Office, Copenhagen. Andreas was registered, in 1763, as a glazier-journeyman in Copenhagen. According to the records of the Glazier Guild, kept in the City Archives of Copenhagen. In 1764 he made his Master exam piece, for the guild entrance examination, and then he became a Glazier-master, receiving his trade license on June 18 of the same year. From 1787 to 1799 he was Director, or head of, the Glazier Guild. He was named as an important citizen in several City of Copenhagen registry/archives. He also published articles about glazing. The family members were apparently well known citizens of Copenhagen. At one time they had a famous actress, Madam Preisler, staying with them for a month before she died in 1797. Andreas married Anna Leth on 31 December 1764 in St. Peters Church, Copenhagen. It was, and still is, a church for the German-speaking community. Anna Leth died 18 October 1778, having had no children. We have a copy of their will, written by hand, 9 February 1770 (4). He then married again, a month and a half later, on December 12 1778, in the Church of Our Lady, the Cathedral of Copenhagen (he was feeling more Danish now!) to Engelche (Waleriusdatter) Walerius, b. ca. 1752. There is confusion about her family name. In the church book it says Waleriue, in the census of 1787 it says Valerius of Yorck, and in the census of 1801 it says Georgsdatter (daughter of George). It is thought that her father was Walerius of Yorck. She died 15 March 1816. They had two children (see next section). 2) Martin, b. 1742 in Danzig. He also came to Copenhagen and also became a glazier. He received his license as glazier-master in the City of Copenhagen on 30 October 1769. His office was at Store Kirkestræde 43 ("Main Churchstreet"). He married Anna Margrete Wegener (née Krieg; her third marriage) on 17 November 1769 in St. Peter's Church, Copenhagen. The International Genealogical Index/Denmark (12) states that he was married 17 November 1769. They had no children. He died 14 March 1790. He is buried in St. Peter's German church in Copenhagen. 1. Engel Dorothea Kaurin, b. 29 July 1807. 2. Kristian Kaurin, b. 7 November 1809. 2) Christopher Magnus Barclay, b. 8 September 1781, in Copenhagen, d. January 19 1828. This form of his name appears in the document on his father Andreas. A different half page typed document in our possession (source unknown) names him as Magnus Christoffer Barclay. Christopher was awarded a degree of law in 1799 from University of Copenhagen. Christopher Magnus and Kristine Berg were married 16 March 1812, in the Church of the Holy Spirit, Copenhagen. They had five children (see next section). Kristine Berg was baptized 20 December 1789 in the Nibe Cathedral, Aalborg, Jutland (12), and died May 10 1868. It is also noted she was baptized at home (16). There is confusion about her name. On what appears to be a copy of her birth certificate (we have a copy), dated 30 September 1808, her name is given as Kierstine. However in all other papers we have that refer to her, she is called Kristine. Her name appears as “Kierstine Mikkelsen Berg” (14). Her mother was Bolette Kirstine Carlsen b. 1759 (or Bolette Kirstine Carlsdatter, christened 19 July 1758 in (16)), and her father Mikkel Poulsen Berg, b. ca. 1756 (according to (16), at at Troejborg Gods in Holstein), d. 26 October 1826 in Nibe. His father was Poul Berg. They apparently owned a house at 256 Fiolstræde at the corner with Krystalgade, where the University library is (was?) situated. Mikkel owned his own boat and was well connected, and his wife’s father was a royal Chalup rower (16). During the war between England and Denmark ("The Battle of Copenhagen, 1807") it is said that one of the first of Admiral Nelson's cannonballs landed in their courtyard! (4). They had 9 children (16). Bolette Kirstine died 29 December 1808 in Nibe (16). Christopher became a customs officer at the Customs and Excise Department in Koebenhavn (16). They seem to have lived in the family house on Fiolstraede, a well known street in Copenhagen. Two of their children were born there: Engelche Marie in 1813 and Bolette Kirstine in 1815. The house may still exist (4).There is a letter, dated 2 July 1810, of which we have a typed copy and a photocopy of the original, written in his own hand to the King, applying for the Customs officer position (4). One record states that he worked for the 2nd Chamber of commerce of Norway but in Copenhagen. Norway and Denmark were still one kingdom at that time (4). Another record states he was given a post in the Norwegian Ministry of Finance and when Norway gained its independence from Denmark he returned to Denmark in 1814 (1). See his 23 October 1810 application for this position (another typed letter) which has not been translated. He applied to work for the Marine Ministry but failed the exam (4). About 1815 the family moved to Nibe, Jutland. Christopher became a parish clerk. Due to the death of the teacher Carl Rosenkilde, he was hired as school teacher and a cantor in the town of Svenstrup, Ellidshøj. Rosenkilde's widow received her husband's full salary for three months. She had also done some teaching and singing in the church as well as feeding Barclay the new teacher for a month and so she was given the teacher-cantor salary for half a year. This information and the following quotes comes from original school district records (from 4) of which we have photocopies (translated by M. Graham and by Signe Nygaard, great-granddaughter of Ane Christensen). "The school teacher Barclay receives (payment) for the last half school year given to him by the Royal Danish Chancellery under November 25th 1815 approved plan for the Ellidshøj [Ellidshøj is the county; the school was in the town of Svenstrup] living's (sic) educational system, assigned, of which the deceased teacher Rosenkilde's widow receives 1/8 (of her husband's salary) in pension. Barclay's salary for half a year: 9 (old Danish) dollars ,1 mark (?) 2 pennies and 2 tønder (barrels -about 139 litres), 5 skæpper (17.39 litres) rye and 4 tønder 3 skæpper barley. "Schoolteacher Barclay does not demand any hay or straw from the district for this year since he sees it as compensation for this, that the farmers have cultivated his land. However the owner of Råkilde farm and Jens Lauresen in Ellidshøj have supplied him with hay and straw, since they did not want to take part in the cultivation of his land." "On February 3rd in the year of 1828 the committee meeting of January was held, in which they regretted to have lost school teacher Christopher Magnus Barclay, and this in such an unfortunate way. He lost his way in the evening of the 19th last month on the heath between here and Gulbech when walking home from Hornum parsonage, where he had delivered an official letter from the county rural dean, and wasn't found until the 21st around noon. He had now become rather orderly in the discharge of his office both in the church and in the school, and we hoped that he in time would become an able and orderly teacher and cantor. If only we in his place soon will find a such [sic] then the parishioners wouldn't be unwilling to build him a proper house." The source (4) confirms that he died, at the age of 47, when he became lost in a rare snowstorm on the moor. He was buried 27 January 1828 in Ellidshoej Churchyard (16). 1) Engelche Marie, b.11 March 1813 in Copenhagen. Helle (16) provides more information and spelles her name as Engelke Marie Barclay. She was christened 15 April 1813. She was in service until her marriage on 11 March 1837 to Peder Nielsen Moeldrup who was a carpenter and builder of mills. In 1847, she has a child, Morten Askersen, by Morten Askersen, with whom she co-habited until 1855. In the census for 1860, she is recorded as divorced. In 1869, she emigrated to America with her son, by then aged 22, and a farmer. Destination was apparently Chicago, IL. 2) Bolette Kirstine, b. 21 November 1815 in Fiolstrade, Copenhagen ((16 notes she was born in Vor Frue Parish, Koebenhavn), and baptized 8 April 1816. There is confusion about her name. We do not have an actual birth certificate and she is referred to as both Kristine and Kirstine. She married Niels Nielson Estrup on June 2 1838 in the Ellidshøej Church, Aalborg, Jutland (12). The pictures below are of Niels and Bolette, sent to us by Poul Estrup. Niels was born April 18 1812 in Estrup, Øster, Hornum, Jutland (according to the recommendation he be hired as a teacher, referred to below) where they lived on a farm. The source (16) however notes “born in Estrup 28 July 1812 in Estrup, Oester Hornum Parish, confirmed 22 April 1827 in Oester Hornum Church. Died 22 August 1886, aged 74, in Svenstrup Parish and buried in Svenstrup Churchyard 27 August 1886. A memorial stone was erected in his memory in Svenstrup Churchyard”. The source (17) also gives the birth date of 28 July 1812. He was in the Army and as there were so many men named Niels Nielsen the soldiers were asked to include their place of origin along with their name. Niels took the name Estrup (8). This is the first use of the name Estrup in the family. We have a record (a separate note, on same page as the teacher recommendation described below) of him being vaccinated (possibly for smallpox) and it is stated there that he was born in Estrup, son of farmer Niels Nielsen and Maren Christensdatter. Niels and Maren (17) had a sister Margrethe Nelsdatter, b. 1814. Niels Nielsen died 1815 (born 1772) at the age of about 43. She remarried Niels Jensen and they had a daughter Maren. He was given the vaccination as he was visiting so many schools. There is an Estrup, near to Hornum. To get there, go from the south-west corner of Aalborg and go west on Highway # 181 for about 15 km, turn left at Nibe, go to Highway #159 and go south about 10 km (4). A note from (4) shows a recommendation for: "Niels Nielsen Estrup of Øster Hornum County, about twenty -one years old, wishes to apply to take the test in the school in Snedsted...in the hopes that he may become a teacher in the Christian congregation (? )....he seems to have a good reputation and has high goals in life. ... I can only give him the best recommendation and say that everyone with whom he comes in contact will benefit. Signed, Øster, Hornum Manse, 21 June 1833, J. E. Grove, Minister. He first taught in a school at Solbjerg. Niels and his family then moved to Svenstrup in 1848 (date from 17) where they lived in the schoolhouse. There is a plaque of his name in Svenstrup at or near the school where he taught (8). Photographs show him with long, curly hair and rather wild looking. He was said (8) to be a faith healer of persons and animals. But, according to the census of February 1870 [in our possession] he was not only a school teacher but also a deer hunter. He preached and spoke fluent French. He was a lead singer in a choir (8). In 1864 the schoolhouse was taken over by the Dragoons and used as billets. (The Dragoons roamed freely over Jutland during the Danish/Prussian War of 1864.) One day a Dragoon stole a chicken but he had not reckoned with Bolette's fiery temper. She proceeded to beat him about the head and shoulders with her fire tongs until he let the bird go. She is described as “small and quick of body and temper. She was no taller than she could stand beneath her husband’s outstretched arm, when he was sitting down” (16). Niels died in 1886 in Svenstrup (6). It states on his gravestone that he was teacher and and a chorister for 40 years. Bolette at age 82 travelled from the schoolhouse in Svenstrup to Ljørslev to see her son, Pastor Estrup, in his full ministerial regalia and to hear him preach. She had never heard him preach. She fell ill the Saturday she arrived. Julius had cancelled a Sunday service at Ørdington to be with his mother, but when he returned to Ljørslev he learned that she had died in her sleep on 14 October 1897 (6). She died in Mors on 14 August 1897 according to (16). She was buried (16) in Svenstrup Churchyard 22 August 1897. They had ten children (see next section). 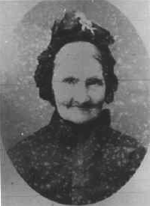 4) Petrea Marie, born 25 October 1823 in Nibe, christened 29 June 1824, Nibe Alborg (12), died 19 February 1835 in Ellishoej (16), aged 11, of unknown contagious illness. 5) Michael, b. 27 May 1826 in Ellidshøj, Jutland, died 5 July 1846. Helle (16) notes: “christened. 21 January 1827. In service, but had unknown ‘problems’ and committed suicide by hanging 5 July 1846 at age 20”. The ten children of Bolette Barclay and Niels Estrup are detailed in this section. See the photo in document of Helle (16) showing the 9 children who lived past infancy; it is taken about 1870 as Julius looks about 10. 1) Emana Henriette, b. 27 June 1839 in Svenstrup, died 23 April 1844 ( four years old). Helle writes “Emma Henriette Estrup” and has the death date as 24 January 1844. 2) Adolphine Margrethe, b. 9 March 1841, in Solbjerg. It is added (16) that she was christened 12 April 1841 in Solbjerg Church and that she married on 20 November 1859 by special license (Kongebrev) to Lauritz Christian Heiberg, born 22 April 1821 in Svenstrup Church. They had 9 children. 3) Nielsigne Marie, b. 30 June 1843, in Solbjerg. Source (16) has different dates: born 3 February 1843 in Solbjerg and christened 13 April 1843. She married on 29 December 1868 in Blenstrup to Marinus Hjorth (14, which see for further information on his ancestors). He was born 19 April 1840 and died 26 August 1893. We have a handwritten Christmas card from her to Pastor Estrup. In our earlier family records, we knew of only four children, all cousins of John Barclay: a daughter, Nels Nielsen, Anders, and Thora (= Victoria?). A more complete list, of 7 children, is provided by (14) and Helle (16) adds an eighth. 1. Jens Christian Hjorth. Born about 1870 (16). a) Agatha, b. 1897, married in Denmark to Thomas Sorensen. He was born in Asaa, Denmark in 1892 and she in Ulvedal, Blenstrup, Denmark on 15 July 1897 (14). He came to Canada in 1929 and Agatha came in 1932 with the first three children although (14), probably more reliably, notes they were married in 1921 and came to America in 1928. They farmed first at Standard, Alberta, as Agatha's brother Marius was already there. She was a seamstress and did sewing; he did odd jobs for farmers in the area. They then moved to Cluny where they had a small farm. The next move took them to Dickson, Alberta where they farmed for many years. For several years Agatha was the chief cook at the Lutheran Summer Bible camp at Sylvan Lake (this Bible camp was still in existence many years later). Later when Agatha became widowed she moved to Calgary and successfully ran a boarding house for many years. She died in Calgary on 20 December 1976 (14).They had eight children (6) (7). Leon Kemp (14) has done a lot of genealogical work on “Thomas Christian Sorensen” and “Abelone Christiane Agathe Sorensen [née Hjorth)” and their descendants. b) Marius, b. 14 May 1899. He emigrated to Canada in 1924 with his fiancée Jensine Jensen. They m. 12 November 1924 and settled in Standard, Alberta and farmed there for many years. In 1938 they moved to Tilley, Alberta. They had two sons: Niels and Harry (see further information in my files). They moved to Brooks, Alberta in 1973 where Jensine died in August 1974. Marius married again on 8 Mar 1975 to Agnes Pedersen, a former Tilley neighbour who was widowed. Agnes died in 1995 having spent her last three years in a nursing home. Marius moved to a Brooks nursing home in 1993 (where his sister Dagmar was also a resident). He died 24 August 1998, aged 99 (3). Marg and Bill Graham visited him unannounced in 1994. Bill writes: "As we entered, Marg could see this old man in a wheel chair. His hands were still huge, but his big body had shrunk and collapsed as will an old hay stack. His 95 years had fallen in on themselves, securely slumped into a too small wheelchair. She rushed up to him and said "Hello Marius". His large head with its long ear lobes turned to stare into Marg's close face. After ten to fifteen seconds he said "Margy" (this after a last contact in the early 50s!). c) Dagmar, b. 23 August 1903 in Hellum, Denmark, had come to Canada in 1928 to visit her brother Marius. Listed as “Dagmar Marie” (14). She first went to Standard where Marius was farming. She then moved to Calgary and got a job as housemaid and nanny for Jim Cross, who was from a wealthy, pioneering Calgary family. They owned the Calgary Brewing and Malting Company as well as a ranch and other properties. (This is the same company that John Barclay later worked for as painter and decorator of their many hotels all over Alberta.) She worked for the Crosses for two years. She worked at several other places and saved enough money to return to Denmark in 1936. She travelled on the SS Grisholm and it was on board that she met Soren Petersen while standing at the railing of the ship. She said "You know how it is - when you are on board ship and a man proposes you either have to say yes, or you have to jump overboard". When they told her father in Denmark of the proposed marriage, it turned out that he knew Soren Petersen and his family. They returned to Canada and were married in Tilley, Alberta in 1938 where Soren farmed. He was one of the first local farmers to utilize irrigation. He won many prizes for his exceptional grain crops. Soren died of cancer in 1977. They had three children: Peter, Dennis, Doreen and an adopted daughter, Elsie (see further information in my files). Dagmar lived in her own home in Brooks for many years and when her health became poor she moved into the Brooks Nursing home (7). Her brother Marius was also there until his death in late 1998. She died there on 13 December 1999. Another child (14) is listed between Dagmar and Agnes: Aage Estrup Hjorth. d) Agnes, b. 2 June 1906 in Thorup Sogn, Aalborg, Denmark. She m. Harry Johansen and had two sons. Listed as “Agnes Kristine Hjorth” (14). They divorced and she never remarried. In 1951 she followed her sister and brother to Canada and settled in Calgary, Alberta. Agnes and John Barclay (who were first cousins, once removed) and Gudrun Barclay were very good friends and visited each other often. Agnes was known for her great cooking skills and her bountiful feasts, as also well remembered by Douglas! One never left Agnes' table hungry. She took in boarders for many years. She was a large woman, physically, with a heart to match. She was known as the "Mother of the Danes" in Calgary because of her open house for all who needed a place to eat or to stay. Agnes had a stroke and lived her final days in the Bethany Care Centre in Calgary, where she died 14 March 1996. Her two sons were Neils and Leif (6) (7) (see further information in my files). e) Marta, b. 1908. “Anna Martha” in (14). f) Jens, b. 1912. “Jens Herman” in (14). g) Jacob, b. 1912. “Jacob Thyge” in (14). h) Lydia, b. 1913. “Lydia Elizabeth” in (14). i) Edel, b. 1916. “Edel Gudren” [sic] in (14). 3. Ane Agathe. Listed (16) as ‘Ane Agatae Hjorth, born about 1874”. 4. Anders, who as a young man was an apprentice farmer with his cousin, Johannes Barclay Estrup in Ajstrup. According to (16), “Anders Stensen Hjorth” was born 1875 and inherited the farm. 5. “Abelone Cathrine” (14). Helle (16) writes: “Abelone Kathrine Hjorth, born 1877”. 6. Christiane. She was (16) born 1879 and died 1893 of TB. 7. Victoria Marie, born 1881 (16). 8. Tabitha Benedicte Hjorth, born 1884 (16). 4) Niels Nielsen, b. 9 February 1845, in Solbjerg. He was christened 20 March 1845 and died about 1876. He was a miller and had a mill at Svenstrump which is reputedly still there. He married Else Kirstine Estrup on 31 October 1869 in Frejlev Church (16). He had a daughter named Anine who was a famous dressmaker. An imaginary sickness of the thigh put her in bed for seven years till a Pentecostal healer (a Danish actress) "healed" her and she got out of bed and walked again (1). They had 4 children. 1st marriage to Else Soerensen. She died 31 March 1878 in Pineberg at age 35. His 2nd marriage was in Frejlev Church 28 May 1879 to Ane Katrine Brucke. They had 2 children: i) Ester Elfrieda Rosenkilde Estrup, born 12 August1880, christened 26 September 1880; and ii) Sigrid Estrup, born 16 July1886, christened at home 5 July 1886. 1. Kirstine Marie Estrup, born 1 December 1875, chr. 16 January 1876. 2. Unknown, born 28 February 1878, chr. 29 December 1878. 3. Johanne Elfrida Estrup, born 6 May 1881, ch. 1 January 1882. She m. (17) on 8 March 1902 Neils Bødker, b. 12 August 1878. He died 24 August 1963 and she died 14 April 1940. They had 12 children. One of their children was Poul Viggo Estrup Bødker, b. 1914. He had two children Frank Nørnberg Bødker and Fans Jørn Nørnberg Bødker. Margaret and Bill Graham visited the Svenstrup cemetery in 2011 and saw Elfrida’s gravestone linking her to the Bødker family. She followed up that contact and eventually communicated with Frank Bødker family who kindly provided a copy of a detailed book (17) on the genealogy of the Estrup and Bødker families written by his father Poul. This book has a great deal more information on the Bødker family. 4. Ejner Holger Estrup, born 27 August 1883, ch. 6 January 1884. 5. Emma Amalie Estrup, born 17 November 1885, ch. 29 August 1886. Furthermore, in the census of 1880 we find in their household: Christen Estrup, born 15 April 1871, ch. 31 May 1871. Victor is not the father of this child whose parents are Else Christensen and Niels Nielsen of Lyngby. 1. Alfred Julius Estrup, born 21 July 1878, ch. 20 October 1878. 2. Jens Victor Algren Estrup, born 13 February 1881, ch. 5 June 1881. He travelled through Europe on a shoestring around the turn of the century, having served his five year apprenticeship as a carpenter. He married twice (bringing his first wife back to Denmark from Bohemia in Austria-Hungary) and eight of his ten children survived childhood. Some of the boys were given Barclay as a middle name. The children scattered broadly, only one staying in Aalborg, with two settling in Norway (Karen and Per), one (Gerda) in South Africa, one (Henry Barclay) in Brazil, and one (Anna) in the US. Paula, Kirsten, and Lise stayed in Denmark. As of about 2008, only two survive: Karen in Kristiansand, Norway and Gerda in Cape Town. He fell ill while on a visit to Copenhagen at Easter in 1967, was hospitalized and died the following day. He was a great raconteur, always wearing a black three-piece suit and bowtie, and always on the look-out for a listener. As a master carpenter, he ran quite a successful business in Aalborg, building himself a large, handsome house in a suburban close (later named Estrupsvej i.e. Estrup Road) in which he was still living at the time of his death. Jerry Avis (19) notes that Karen and Gerda were of Jens’ second marriage to Nielsine Pedersen. He is from South Africa and a son of Gerda Avis (née Estrup). He notes his elder brother Michael in Watford, UK has Barclay Estrup in his name. Mitzel Valentin (ID-421, married to Ole), his grand-daughter, now lives in Surrey, England (18). 3. Oskar Christian Marius Estrup, born 1 July 1883, ch. 26 December 1883. 4. Emma Florenthine Agathe Estrup, born 21 May 1891, ch. 30 August 1891. 8) Poul Poulsen, b. 13 September 1853, in Svenstrup. He was christened 13 November 1853 (16). John and Gudrun Barclay named their son, Paul, after Poul. He was sent to Copenhagen to Teacher's College with his brother Julius. He married Emma Claire Petersen. Her name appears as “Emma Clara Petersen” (15) and probably more reliably, in (16) as Emma Elene Pedersen. They were married in Garnisons Church, Koebenhavn on 24 May 1887. Emma was born 23 June 1857 at Foedselsstiftelsen, Koebenhavn. Christened 7 July 1857 and died 19 August 1941 in Aalborg. Helle (16) provides further information on her early years and notes she was adopted. The adoption papers were released by the Government 100 years after the adoption. 1. Arthur. Arthur ran (or worked at?) a private school in Denmark which failed and he then moved to Canada. He started a commercial painting and decorating business in Calgary, Alberta, ca. 1929. Arthur's cousin, John Barclay Estrup, worked for him briefly during this time (stimulating John to begin using the name Barclay to avoid the confusion of two Estrup painters in town). Arthur later experienced mental problems and attempted suicide. He avoided being sent to the Ponoka mental institution, near Edmonton, Alberta only because of the intervention of the Danish Foreign Ministry upon the request of Arthur's uncle, Pastor Estrup (8). He was sent to Denmark where he remained in a mental home for several years before recovering. He married Elva, one of his nurses from the home. He became a schoolteacher and a principal of a school on the west coast of Jutland. He was an organist and an excellent artist. He painted a very good self portrait which hangs in the home of Poul Estrup. Poul Estrup has recently contacted one of Poul Poulsen's granddaughters and she is "like a new sister" to him (8). This Arthur is presumably “Niels Peter Arthur Estrup” (15), son of Poul Poulsen Estrup, born 18 June 1890 (or a different son?). This man had a daugher Else Benita Estrup with “Theodore Johanne Lundoe” [sic], to whom he was not married. Else, who died in 1992, was married to Bent Knudsen (15). 4. Emma Kathinka Estrup (13), born 2 April 1884 in Svenstrup, Jutland. She married Sofus Emil Aasted, born 1888, one of 14 children (two of whom emigrated to the US). He later became the mayor of Ebeltoft in Jutland and a customs officer. One of his granddaughters is Helle, source (13). 9) Emma Henriette, b. 10 March 1857. The following is quoted from a paper entitled "The Grocery shop by the old school". Assistance in translating it was received from Signe Nygaard and from Gry Estrup, daughter of Poul Estrup. "1877 -- on the 6/10 bachelor (Jacob) Peter Thomsen (Wacher) reported the marriage between himself and miss Emma Henriette Estrup, born in Estrup, Ø. Hornum, on March 10th 1857. 1880 Census: Jacob Peter (Thomsen) Vacher (Wacher), 28 yrs, married, b. Vadsted (Vejle), Grocer. Emma Henriette Vacher, 22 yrs. married, b. Hornum, housewife. Peter Thommesen Vacher 1 yr, b.  Copenhagen. 1881--- 29/4 died Jacob Peter Thomsen Wacher, 29 years, of 'black' lung (tuberculosis). 1885 -- christening, farmer, Victor Andreas Estrup's child, godmother widow Emma Vacher, godfathers miller Peder Estrup of Vejgård Mill, Student Julius Estrup and representative Estrup both from Copenhagen. 1886--- died Emma Wacher, widow of Grocer Wacher, teacher Estrups daughter, 30 years. As the above shows, it was teacher Estrup's son-in-law (Jacob Wacher, married to Emma Henriette) who started the grocery shop, not in the old school, which wasn't replaced until 1885, but nearby. Poul [Poulsen] Estrup (#8 child) had presumably taken over the store after the death of his brother-in-law  and then after 1885 moved it to the old school. In the census of 1901 Poul Estrup lives in Ellidshøj, but he still owned the house by the old school in Svenstrup" (4). More complete information is provided by Helle (16): christened 7 June 1857, died 1886 of cancer, aged 30. She married on 28 October 1877 to Jacob Peter Thomsen Wacher, born 7 January 1852 in Vadsted, Fredericia. Emma’s father, Niels Nielsen Estrup built a house for her and her husband and they ran a grocer’s shop in Svenstrup from there. Jacob was unwell and died of TB 24 April 1881. They had one child: Peter Thommesen Vacher, born 1879 in Koebenhavn. 10) Julius Benedict Estrup, b. 5 September 1861 in Svenstrup, the last child. His mother was 46 years old when he was born! He was christened 24 November 1861 (16). Home life was austere and there was never much money. Nevertheless, the parents managed to save enough so that they could allow those children with the ability and desire to study to become educated. The home was operated on very economical lines. Large batches of bread were baked at one time. However, by the time the end of the supply was reached most of it had become mouldy and stank. If a child dropped a piece on the floor he was required to pick it up and to kiss it, before having to eat it, to show proof of his devotion and gratitude for the Lord's gift. Physical punishment was not used in the home. A word or a look was enough to command immediate obedience (2). It is thought that many of the boys became millers. One of them had a mill at Vejgaard and there was an Estrup that had a mill at both East Svenstrup and West Svenstrup (6). In 1879 Julius and his brother Poul, attended the Blaagaard Seminary to become teachers. Julius soon realized that he wished to become a pastor and enrolled in Theology at the University of Copenhagen. He taught mathematics at a Copenhagen boys' school to supplement his income. He became an ordained Minister of the Lutheran Church. He married Ingeborg Larsen on 24 March 1891 in St. Mathews Church, Copenhagen (see the Larsen chapter for more information on his wife and her family). We have a photocopy of their wedding announcement with photos of them both. His first call was at Lørslev on the Island of Mors. They were at Lorslev for 15 years and it was there that he became a fundamentalist. We have copies of several of his sermons, in Danish, e.g. his sermon for 14 January 1917 (4). Much was written about Pastor Estrup in newspapers and magazines especially when he was at the height of his fundamentalism. He was a very controversial figure due to his break from the Danish Folk Church. One book, written by his daughter Else, and edited by E. Steenvinkel, called "Faith and Home Life" details his ministerial life (2). Finn Schou wrote: "There are two major schisms within the Danish Folk Church. The followers of Grundtvig, also known as 'The Happy Danes', and the Inner Mission. Without detailing the many differences, suffice it to say that Grundtvig preached about a benevolent God whereas the Inner Mission folks only heard about hellfire and damnation" (2). Converting to the group of the Inner Mission changed his whole outlook on religion and also meant that the family had to follow the strictness of this type of religion. He involved the children in that they had to go out and collect their friends and others and march them in procession to Sunday School which was held in the afternoons. They moved in about 1910 to Ølby near Struer. After eight years there they moved to Farsø. He was very strict and demanding of his family and his parishioners alike. He never struck his children and in his way loved them. He tried to be a good parent: he taught them to skate on the nearby pond, and made every birthday a memorable event. When he was home he would always tell the children a bedtime story (2). Pastor Estrup travelled widely across Denmark often giving sermons to thousands. He was one of the most respected, popular and best known ministers in Denmark at that time. He contracted pneumonia while attending a funeral outdoors in January and died 8 January 1930, and was buried 14 January 1930. There were apparently 3000 people at his funeral! The parish people collected money and set up a granite plinth in his memory. It still stands in the graveyard at the Farsø Church. We have a copy of a long letter 11 January 1930 from Andreas to his brother John about the funeral. 1) Karen Hedvig Else Estrup, b. in Copenhagen 14 August 1895, christened (16) 1 December 1895, died in Rødovre, Copenhagen, 1 December 1985. She m. (date?) Christian Paaskesen, b. in Øelby 17 November 1896, d. in Rødovre, Copenhagen, 27 December 1976. Both are buried at the churchyard in Øelby (4). Christian came from a wealthy family. He was an only son and was expected to go into the family business of exporting large farm machinery. They had received a huge order for machines from Russia. They put all their money and resources into filling this order and duly sent it off. However, they were not paid in advance and the machines were never seen again and the family went bankrupt. It was just at this time that Christian and Karen were getting married. In spite of this terrible disaster the family put on a very lavish wedding for their only son and daughter-in-law (9). I have a story written by Ingeborg about the terrible snowstorm of 1923 in which her parents almost perished. Karen and Christian had a small farm for a few years and then they ran a dairy in Bækmarksbrø. Later they moved to Copenhagen where Christian worked in his son Jule's hot dog bun factory. They had six children starting with two successive pairs of male twins (6). 1. Julius ("Jul"). 2. Frands. 3. Aksel. 4. Børge. 5. Vagn. 6. Ingeborg ("Ingse"). 2) Else Marie Estrup (6), born in Ljørslev, Mors 26 September 1898. She stayed home to look after her mother and never married although she was engaged to a soldier. He was not thought to be good enough for her and Pastor Estrup broke up the engagement. She was never trained for any career but was always active in church work and did quite a bit of writing, especially about her father (see footnote 2). After her Mother died, she moved into a government "Home for Unmarried Minister's Daughters" at Christiansdal, Glumsø. She visited John and Gudrun in Canada. She was a good pianist, very spirited, and loved to sing. She died 9 August 1982 of breast cancer, and is buried in Næsby (4), close to Christiansdal where she lived. 3) Johannes ("John") Barclay Estrup, b. December 25, 1901, in Lørslev on the Island of Mors. Material here on John Barclay was largely provided by him (1) or came from various family members (6). After attending private school in Struer he attended an Agricultural College and obtained a degree. He was artistic and musical and played the "horn" in a local band as a teenager. He was also an accomplished violinist. He became an apprentice farmer at Ajstrup with his cousin Anders Hjorth. He was there for two years and later was foreman on several farms near Randers. At age 22 he put in a year of compulsory military service at Fredericia. He then decided to purchase some land so that he could have his own farm and get married. He had to borrow money to do so and presumed that his father would be the guarantor but at this point a conflict arose with his father over this issue. He left Denmark shortly after, in 1928, and would never again be in contact with his father, who died shortly after in 1930. John would not return to Denmark until 1958. Among our papers there is a postcard sent to Karen and Christian Paaskesen (given to Margaret by Aksel who found it among his mother's [Karen] papers). It says, translated by Marg Graham, "Dear both of you, Now that I have arrived in Holstebro I am sending you my last greeting while I am here in Denmark and sending you very many thanks for the wonderful [?] times but now the time to go is here. I will write as soon as I arrive at the other side of the world, but I do not have time for any more now. Say Hello to the children and little brother [Andreas] and Mother and much love and greetings. Yours with love, Johannes." It was written in Holstebro on May 8 1928 and was mailed in Hamburg on May 10. John was twice engaged to be married before he left Denmark. We have a newspaper clipping (4) regarding Johannes' first engagement: "Engagement. is hereby declared between farmer Johannes Estrup, the son of Pastor Estrup and Miss Hanne Buus, Daughter of Farmer Jens Buus, Strandby." That apparently did not work out as he later became engaged to a woman named Herthe. It has been said (Ingeborg, pers. comm.) that Johannes borrowed money from Herthe with the idea that she was to follow him to Canada as soon as he got settled but he was never able to repay her the money. He broke off the engagement when he met Gudrun Christensen fairly soon after arriving in Canada. Herthe did not marry until she was 43 years old, to an engineer whom she met through her job in a home for retired gentlemen (6). There is a letter from Jul Paaskesen (in Jul's possession) to his mother, saying that he would have liked to go with Uncle Has [Johannes] to Amerika "but I have to wait until Herthe is going over there". It seems that Johannes was very fond of Jul and offered to take him along to America. After this difficult start to life, Johannes was off to "Amerika" at the age of 27. He would almost never talk again of his last years in Denmark. Most of the following on his life in Canada was told to Douglas and compiled for the first version of this family genealogy (1) and then has been rewritten here by his daughter Margaret Graham with many additional details from various sources. Wooed by the immigration posters of the C.P.R., Johannes emigrated to Canada, traveling from Hamburg to Southampton to Quebec City, on board the Canadian Steamship Mont-Royal, arriving 24 May 1928 (4). While on board the ship he sent a letter to his mother, dated 23 May 1928, which is in the possession of Margaret Graham and was translated by Gudrun Barclay. Along with several other newly arrived immigrant Danes, he took the train to Sherbrooke, Québec where they were required to be farm laborers and where they were chosen by the farmers in "slave market style". John worked on a farm at Brighton, Québec for three and a half months, "18 hours a day", for $35.00 per week. These farmers were quite good to him. After a short-lived job in the Marconi Radio Factory assembly line, he joined a "harvest train" heading west. He worked for a few weeks on a farm in Osage, Sask. (where he was falsely accused of burning the barn down) and ended up doing a variety of jobs in Winnipeg. He worked in a saw mill, a coal company, and as an auto mechanic. It was at this time in Winnipeg that he first met his future wife, Gudrun Christensen (see Christensens for much more information on Gudrun, her family, and their life together) while staying at the Danish Community Home, Dana, in Winnipeg. He was a very talented violinist and used to play in concerts at the Danish Home. John and Gudrun met during a concert at the Hall where he was playing and Gudrun was singing. John's cousin, Arthur Estrup (see above), was at this time working in his own painting and contracting company in Calgary. John moved to Calgary and worked for a short time with Arthur. It is at this time that, for convenience, he decided to use his middle name Barclay to reduce the confusion of having two Estrup painters in town. Furthermore Barclay was not as foreign sounding as Estrup. The name Estrup was thus taken for convenience by Niels Nielsen ca. 1830 and dropped for convenience by John a hundred years later! Arthur was not very reliable about paying wages so John and a friend, Henry Vernon (Vernon's grandson, Mike Vernon, would later be a goalie for the Detroit Red Wings) formed their own painting company. Gudrun also at about this time moved to Calgary because her brother Kaj was there and she also knew that Joyn Barclay had moved there. John and Gudrun married on 20 May 1929, and their future looked quite bright but then the Great Depression struck.Their first child, Anna Margaret, was born on December 19 1929 and Paul would follow in 1931 (for the two children, see section below). The Depression years involved a constant search for work and going from house to house hoping for anything. He worked on painting contracts, digging ditches, bush burning, construction work, and while on City relief (i.e. equal to welfare) was part of the gangs that excavated Glenmore Reservoir, by hand. He was also the maintenance man at the Wellington Apartments in Elbow Park in Calgary. Gudrun did the cleaning and they were given a free apartment for all this work. It was at the Wellington Apartments that they first met the Smalls who were their neighbours. They were saved many times by these good neighbours who brought gifts of food when there was none in the Barclay larder. They became surrogate grandparents to Margaret and Paul. See "The Smalls" by Margaret Graham for a complete portrait of these friends who became part of the family. Margaret has in her possession a marvellous film made my Mr. Small in about 1934 featuring the two young Barclays in an elaborate home-made movie set! In 1934 John came close to dying of pleurisy pneumonia. To pay the doctor's bills, John painted the doctor's house. He ran his own contract painting and decorating business until 1942. He fortunately never showed signs of lead poisoning that was a danger due to the leaded paints that were in use at that time. They bought a nursing home which Gudrun successfully ran. He was then employed by the Calgary Breweries as a painter-decorator working in their hotels across the province. The Breweries sold their hotels in 1950 and so John was out of a job. At that time they sold the Nursing Home and built Barclay's Motel at 5307 Macleod Trail in Calgary which they ran for twelve years. The motel was built of cedar logs and during this time he also worked as a salesman for various companies building cedar log homes (Panabode, Cedar Log Ltd, and Alta-Cedar Homes). In the late 1950s he also sold real estate for two or three years. When the motel was sold in 1962 they built a new home at 27 Selkirk Drive, SW and retired. After retiring, John Barclay did the occasional painting and decorating, mostly for friends and for old customers. At age 75 he was still climbing up on roofs to paint them. His garden, especially his rock garden, was his pride and joy. He also became very involved, with Gudrun, in lapidary work. He produced beautiful jewelry and specialized in bolo ties. He also taught several lapidary classes in his home. On Christmas Day, 1981, he and his family celebrated his 80th birthday. He was talkative, outgoing, friendly, and would often get involved in conversations with complete strangers. He hated playing games of any kind but he did, in later years, entertain himself with a game of Solitaire after supper almost every night. He loved animals and had two much loved and spoiled dogs, Pinky and Sammy. He died 24 October 1983 of lung cancer, in his home with his wife and daughter at his side. There is a tombstone in the Sunset Cemetery, Calgary. 1. Poul Benedict. 2. Anna Johanne ("Hanne"). 3. Inge Margrethe B. Estrup ("Grethe"). 4. Lene Barclay Estrup. 1) Anna Margaret Barclay Estrup, b. 19 December 1929. She married Bill Graham on May 9 1955 in Calgary. See Grahams for more details on their married life and for information on their three children. 2) Paul, b. 13 February 1931 in the Scottish Hospital, Calgary. Much of the text here on Paul was provided by his wife Pat (5). He graduated from Western High School in 1951 and then enrolled at the University of British Columbia. He graduated in 1957 with a four year B.Sc. degree specializing in Forest Entomology and Botany. In August 1953 a couple of months were taken off during the course of the degree to meet his sister in Denmark. They traveled to Italy and also visited most of the Danish relatives. They returned home in November 1953. An interest in Forest Entomology was stimulated and maintained by eight summers of work at the Forest Entomology research stations (where Bill Graham was also working; it was Paul who would introduce Bill to his future wife) at Kananaskis and at Mt. Eisenhower. After graduating, he returned to Calgary and worked with his parents at Barclay's Motel until 1960. He had met Patricia Westwood in the fall of 1956 at University of British Columbia (UBC) and they were married two years later on 13 September 1958. They had two children John and Kirsty (see below). In the fall of 1960, the University of Alberta at Edmonton started its Calgary campus (later to become University of Calgary). Paul was becoming an expert botanist and taught introductory Botany that year at the new campus. In the school year of 1961-1962 they were at the the University of California's Berkeley campus where Paul was working on a Master's Degree. One course short of his Master's, they returned to Calgary where he taught another year at the Calgary campus. In the fall of 1963 they went to Aberdeen, Scotland where Paul had been accepted into a Ph.D. programme with the University of Aberdeen from which he graduated three years later, in 1966. His Ph.D. thesis study was on cyclical processes in Scottish Heather, Calluna vulgaris. In the fall of 1966, the Barclays returned to Canada where Paul accepted a position of Assistant Professor at Lakehead University in Thunder Bay, Ontario. He became a Full Professor in 1976. For his sabbatical leaves, the whole family spent 1972-1973 in Youbou, B.C. and 1979-1980 in Belize, Central America where Paul studied lichen communities on coconut palms. For his last sabbatical leave in 1987-1988, Pat and Paul traveled to England and Denmark before settling in Scotland for two months, where Paul worked on a study of seed shedding in Scottish Heather. Paul was the principal scientist with an important acid rain project that ran from April 1982 to about April 1987. The Northern Ontario group that Paul headed had a million dollar budget and was one of four such projects in Ontario set up to monitor acid rain. He also consulted for Ontario Hydro at this time. Among the courses he taught at Lakehead University were Introductory Plant Ecology, Plants in Relation to Man, and Bryophytes and Lichens. His research interests, which resulted in the publishing of many scientific papers, include among others, the monitoring of air pollution through the study of lichens. He enjoyed teaching at all levels and was very much respected by his students. He built a little "hide-a-way" out of Thunder Bay, in the bush on the Arrow river just off the Devon Road. It was just a small hut but he loved to be out there and to commune with nature. Paul was also a very keen and knowledgeable gardener. In March 1988, they went to Nantucket where Paul gave a paper on "The Distribution of Scotch Heather in Canada" for an "Ecology of Heathlands" conference. In May 1988, Paul Barclay-Estrup was diagnosed with chronic lymphocytic leukemia, with a prognosis of one to four years. He continued teaching at Lakehead until going on long-term disability in 1990. In 1992 he achieved complete remission with the help of a new doctor and an experimental drug, and at this time they moved to Salt Spring Island in British Columbia. It seemed as if he might have beaten the disease, but the leukemia returned in 1994. He died at home, in Salt Spring Island, on June 21, 1996. See also a separate account "Memories of Paul", written by Margaret Graham. The Barclay/Estrup text for the original A Family Reunion of July 1982 (1) was written by Douglas Graham drawing heavily on information collected from his mother, Margaret Graham, his grandfather, John Barclay Estrup, and his grandmother, Gudrun Barclay née Christensen. This original family history was then completely rewritten and updated by Margaret Graham (née Barclay Estrup) in August 2001 with a final update in October 2001. She gathered new information from a variety of family members and other sources, as indicated in the footnotes. Several visits to Denmark (including Douglas Graham in 2000) were important in making and maintaining contacts and gathering information. Of particular importance as source of information were Poul Estrup, Ingeborg Møberg (née Paaskesen), Hanne Estrup and Aksel, Børge, and Jul Paaskesen. Translations of various documents from the Danish are by Margaret Graham unless otherwise indicated. A particularly important source for much of the new information on Pastor Estrup and his ancestors is the book about him (2) written by his daughter Else. (1) Material included in the original A Family Reunion of 1982 and thus based mostly on recollections of John Barclay. (2) Hjemliv og Trosliv (Faith and Home Life). A book about Pastor Estrup and another Pastor, edited by E. Steenvinkel. The section on Pastor Estrup was written by Else Barclay Estrup (a copy in the possession of Margaret Graham). This book has been translated into English by Finn Schou, Husband of Alice Schou, a Bruun family member. It is a fascinating story about a very interesting man. The full translation is in the family records. (3) Obituary of Marius Hjorth, probably from a Brooks newspaper, August 1998 (in our files). (4) Various documents received from Ingeborg Møberg, copies now in our archives. She has also contributed many photos. (5) Submitted by Patricia Barclay, ca. 2001. (6) Miscellaneous information from various family members. (7) Personal communication between Dagmar Petersen (née Hjorth) and Margaret Graham, about 1994. Also Hjorth family information from her son and his wife, Dennis and Inga Petersen, of Tilley, Alberta. Note that the Hjorth Family History Book can be obtained from: Flemming Hjorth, "Thustrup", 9529 Skorping, Denmark. Cost about $70.00. We have not consulted this source. (8) Information, documents and photos graciously contributed by Poul Estrup by correspondence and during the visit with William, Margaret, and Douglas Graham in October 2000. Poul's daughter Gry contributed some translations. (9) Personal communication between Aksel Paaskesen and Margaret Graham, October 2000. (10) Personal communication between Børge Paaskesen and Margaret Graham, October 2000. (11) Letters to Marg Graham from Hanne Estrup, 23 January 2000, 2 February 2001, and others. (12) Latter Day Saints IGI Web Site: http://www.familysearch.com. (13) Personal communication with Helle-Merete Espenhain Mugridge, nee Aasted [ID-234] in November, 2006 (granddaughter of Emma Estrup). (14) Personal correspondence with Leon Kemp [ID-355] in early 2008. Some additional information from him in my files. (15) Personal correspondence with Bent Knudsen [ID-356] in December 2009. (16) Family history of Barclay and related families by Helle Mugridge [ID-234], dating from about 2008. (17) En historie om…min family Estrup go Bødker go om min by Svenstrup (A history about my Estrup and Bødker family and my town of Svenstrup) by Poul Bødker (no date). (18) Personal correspondence with Ole Valentin [ID-421] August 2013. Email in my files with further information. (19) Jerry Avis [ID-F450], email correspondence Sept. 2013.